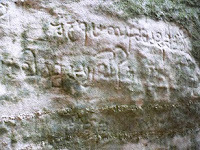 Edakkal Caves is around 10KM from Sultan Battery. The shortest route is via the single-lane road starting at the Manichira turn-off near Sultan Battery on the Kalpetta to Sultan Battery state highway. The far better option is to take the Kalpetta State Highway (212) route and take the turn-off (at ~5KM from Sultan Battery) to the Left for Edakkal Caves/Ambalavayal at Kolagapaara Junction. It is an additional 3KM, but the newly constructed rubberized two-lane scenic road from Kolagapaara makes it very worthwhile - it is around 9KM from the turn-off to Edakkal Caves - there is a sharp v-turn up the hill after around 7KM. There are several parking spaces near the Edakkal Caves entrance - some are paid-parking areas while others are free. It is best to drive up the steep hillock to the entrance gate and look for parking on the way down as otherwise you will end up walking the distance to the entrance gate (curio shops line the area till the entrance on either side of the road - they mostly sell Wayanad spices and such - very reasonable pricing although quality for some items such as home-made chocolates are below par). 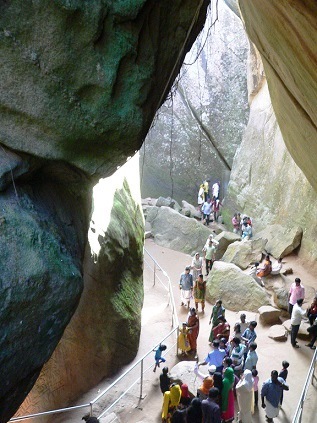 The Edakkal Caves ticket counter is around 1KM up a steep walk-way from the entrance gate - this pathway also has several shops lining both sides selling everything from curios, spices, and drinks - honey amla (gooseberry marinated in raw honey - both from the forest) and Bamboo Rice Payasam are the popular items here. They sometimes have Jeeps taking people up to the ticket counter for a Rs 100 fee. Tickets are Rs 20 pp (camera Rs 30) and are open from 9AM to 4PM (Monday holiday). 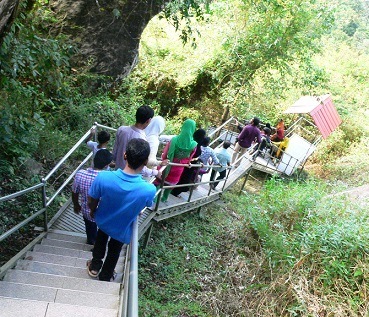 From the ticket counter, there is a short pathway followed by winding steel stairs (300-odd steps) till the cave. It takes upward of two hours for the hike and back. 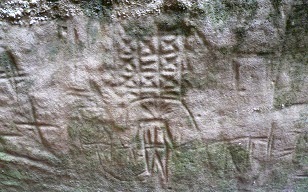 There was a trek further up from the caves to a viewpoint but that is now closed to the public. The cave itself is a marvelous natural wonder. There are a couple of huge granite rocks and between them is another rock stuck in the middle, thus forming the giant cave structure (depth about 30-feet) - the site got its name from this precarious rock formation - ‘Edakkal’ literally means rock-in-between. The historical significance of the cave is the presence of several sets of petroglyphs: the youngest are believed to be over 2000-years old and may have a connection to the Indus Valley Civilization while the oldest date back to over 8000-years - the pre-historic stoneage carvings are very rare and are the only ones in South India. The site is maintained by the Wayanad District Tourist Promotion Council (DTPC) and their personnel man the site during visiting hours. Less than 5KM from Edakkal Caves is Ambalavayal Heritage Museum (aka Wayanad Heritage Museum, Open 10AM to 5PM). 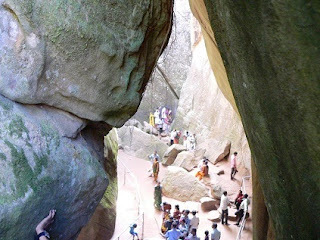 To get there from Edakkal Caves, at the sharp V-turn to Kolagappara on the Vaduvanchal-Kolagappara Road, take a Left instead and go about 3.5KM to the Museum turn-off on the Left (Government Hospital Road). It has one of the largest collections of archealogical relics and artefacts from the neolothic period to around the 17th century AD (presented in three types: Gothrasmruthi, the Devasmruthi, and the Jeevanasmruthi). Memorial grave stones and stone age hunting equipment are the highlights. Meenmutty Falls is ~13KM on the same road (Vaduvanchal-Kolagappara), around 3KM after the Meppadi route turn-off (SH29). The final stretch (about a kilometer) is very bumpy and it is best to park your vehicle on the muddy pathway and hike down the rest of the way - the way back up is strenuous and no services. There is another Meenmutty Falls near Banasura Dam and that is more popular and has more services as well (tickets are Rs 50) - it also requires a good kilometer or so of hiking. The Trail and the Falls are very beautiful in both these locations. Soochipara Falls is around 16KM from Meenmutty Falls (the one near Vaduvanchal) - from Vaduvanchal-Meppadi Road (SH29), take a Left turn at Meppadi to Chooralmala/Soochipara, and it is about 3KM from the turn-off to the Right. Parking lot is 2KM from this point and there is another 1KM hike to the Falls. Tickets are Rs 50 (open 8AM to 5PM). Here again, the trek down is easy and picturesque while coming back up can be strenuous. There are several other Falls in Wayanad district and many are largely unexplored. One thing to be aware of is that the terrain is slippery and dangerous especially during the monsoon - the ones with facilities are closed during monsoons. Wayanad - Edakkal Caves, Ambalavayal Heritage Museum, and Soochipara & Meenmutty Falls - Review (this post). Wayanad - Banasura Sagar Dam, Kuruva Island, & Pazhassi Tomb - Review.